My morning routine was pretty simple. Especially in comparison to the amount of nighttime products. Now don't worry, I don't use all of these in the same night. That would be crazy, but sometimes I try to mix it up if my skin feels like it needs something or I just want to have a bit of a pamper session. The cleanse, tone, moisturize routine of my morning skincare routine stays the same, but a few additional steps are added in-make-up removal and masks. 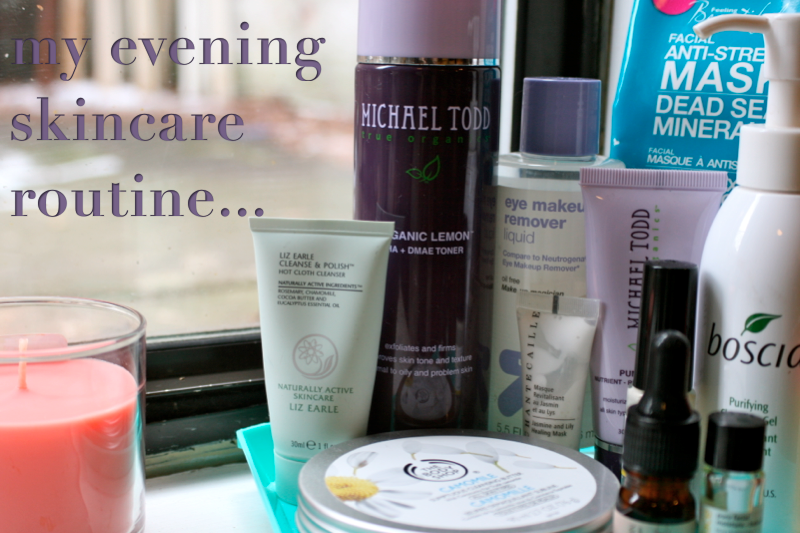 For nighttime cleansing, I want to use something that really gets rid of make-up. In the shower, I keep the Boscia Purifying Cleansing Gel. It's your typical gel formula, but without drying sulfates. It does a great job removing make-up without stripping my skin. However, lately I have been delving into the world of cleansing balms. I really like using The Body Shop Camomile Sumptuous Cleansing Butter or the Liz Earle Cleanse & Polish before hopping into the shower. They remove make-up, plus make your skin full super plump and hydrated. And using them with a muslin cloth adds an exfoliation factor as well. I am pretty heavy handed with the eye make-up, so I use the Target Brand Eye Make-Up Remover on a cotton pad to remove any leftover liner or mascara. After that, I either tone or put on a mask. On your typical evening, I will go straight to toner. I love the Michael Todd Organic Lemon Toner. It chemically exfoliates to increase cell turnover for healthy, bright skin. I have been wanting to try the Pixi Glow Tonic since it's now available in the US. Finally, I'll moisturize with either the Josie Maran Light Argan Oil or the Suki Face Pure Facial Moisture Balancing. If my skin is feeling dryer, I'll use the argan oil. If it's oily or I have some breakouts, I will use the Suki oil since it contains chamomile and echinacea which have anti-inflammatory properties. Recently, I have been using Rosehip Oil for my nightly moisturizer (my latest skincare products can be seen here). I also make sure to moisturize my lips. I like the Burt's Bees lip balms and am currently using the grapefruit flavour. Now, if I am in a pamper mood or just need to calm down and relax, I'll use a mask. I think of masks in three basic categories: detoxifying, hydrating, and exfoliating. Detoxifying are your typical clay masks. They harden with time and feel like they are extracting/tightening your pores. The Freeman Anti-Stress Dead Sea Minerals Mask is a super affordable and effective option. I don't use hydrating masks too often, but they are the lotion-like consistency masks. Some are designed to either be worn for the 10-20 minutes or overnight. Over the winter, I used the Chantecaille Jasmine and Lily Healing Mask to help hydrate my skin. A lot of times though I will use it just along my eyes and wear it overnight. My current favourite mask type are the exfoliating kind. These typically contain Alpha Hydroxy Acids, such as Glycolic acid, that 'eat' away at surface cells to reveal new cells, leaving skin appearing brighter. I love the Michael Todd Pumpkin Mask because it's gentle while still noticing results, and it smells like pumpkin pie. Another option is the Juice Beauty Apple Peel which comes with a sensitive version. I added a new mask into the rotation, seen in yesterday's haul. After using a mask, I make sure it's all removed and proceed with the toning and moisturizing step of my routine. Hopefully that wasn't too many details- I promise it's simple! I only use one cleanser a night and a mask once a week or so, so it looks like more than it is. The most important evening skincare routine is making sure to remove that make-up and moisturize so your skin can keep it's normal balance. As for a final tip, masks are fun- so have a pamper session tonight!